As promised ages ago the following is a blurb about my ankle injury. Photo One: Permanent damage from loss of tissue to the Tibilais Posterior tendon caused by cortisone injection. She is compensating for loss of muscle function with overuse of other muscles which shows as an unusually contoured foot. I originally contacted you back in early September of 2006 to get a second opinion about an ankle injury that had been an ongoing issue for me for close on a year. I first became aware of a problem whilst training for the Kepler Challenge last year (2005), it started out as niggling pain on the inner side of the left calf and I initially assumed it was my Achilles reacting to a running load that was heavier and faster than usual. I had been training with guys and as a result was pushing myself harder and faster and training runs were tending to become all out races. When easing back, reducing the load and rest did not seem to help I went to a local physio for advice. The physio initially treated me for a strained soleus but then arranged an ultrasound which showed tendinitis in the Tibialis Posterior tendon just above the left ankle. The doctor who reviewed the ultra sound offered to "whack in some cortisone" there and then as a cure. The physio also recommended cortisone and referred me to a sports specialist who arranged for a cortisone injection under ultra sound. The specialist said that usually he recommends a two week break to let the cortisone work but that as I was training for an impending race to take two days rest before getting back into training. The cortisone gave a fairly instant result - within a couple of days there was no sign of the injury left. All pain and swelling had disappeared. I went on to train and run not only the Kepler Race but several others over the ensuing months with seemingly no injury issues - BUT.. about six weeks after the injection I was left with an obvious hollow at the injection site and what was clearly a more seriously damaged tendon than I'd started out with. I went back to the sports specialist who advised to take 3 months absolute rest from weight bearing exercise - which I did. But by the end of that rest period there were still obvious lumps along the tendon line below the ankle and the ankle bone itself was still nearly hidden by swelling. 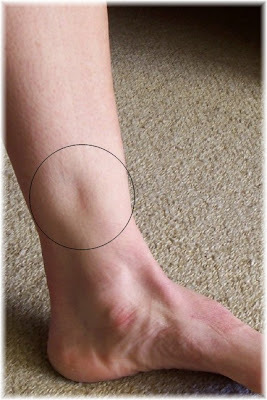 On returning to the sports specialist I was sent for a second ultra sound which showed that the synovial sheath of the tendon showed degeneration with 'ganglionic lumps' along it in an area below the ankle bone and the tendon above the ankle bone showed fluid and swelling with secondary scar tissue. The original injury had been exacerbated by the cortisone injection and the consequences of it enabling me to run through the injury for too long. The specialist arranged a referral to an orthopaedic surgeon. When I got to see the surgeon around 8 weeks later the Surgeon stated that surgery was the best solution but that it had to be my decision and should be done once I was sure that I could not run without it as being able to run after surgery was not guaranteed. The surgeon said that the operation would involve scraping down the tendon and if necessary - using a neighbouring tendon to help bear the load. He advised and arranged for for orthotics to be made up and for me to go from neutral running shoes to Nike Gel Kayanos with the goal of starting to run on a treadmill - 3 x a week - building up by no more than 10% each week and starting from around 5 minutes at a time. Not happy with trying to build up running on a still injured ankle I went to a different (recommended) physio and a massage therapist to see if I could avoid surgery and get some improvement. Regular massage treatment & acupuncture helped to a point that the ankle was visibly much less swollen and much of the scar tissue had been broken down. But the tendon was no longer doing the job it should be able to do and walking bare foot was uncomfortable. The sports specialist then made a call that he didn't think that the injury was is realistically going to improve enough on its own to allow me to run comfortably again so sent me back to the surgeon as he thought that the surgery track was the likely solution. At that stage I felt as though I was just being passed from one specialist to the next. The physio who I had been making slow progress with suggested getting a second opinion before going to the drastic measure of surgery, and your name came up as a possible person to contact. After an appointment with you and dutifully following your exercise instructions I feel that I've gained some strength and am feeling a lot more positive about running again than I was before talking to you. Though the injury is by no means better, It has improved significantly since I was first sent to the surgeon and that improvement has come form strengthening exercised that you prescribed and from shear damn determination to do everything possible to strengthen and get back to at least being able to run with enjoyment again. In the process I have learnt that there is rarely a single solution to an injury and that you really need to educate yourself and question advice given even if it is from professionals who know more than you. I am now at a point where I can run fairly comfortably for about 30 minutes (abet at a slower pace than I'd like) and where I can still see improvement week to week in strength and the visible look of the ankle. I've taken up mountain biking and spin classes to help get a good level of fitness back and have even partaken in a couple of bike races. Hard task is going to be holding of from getting out on the road running again to soon. Update on the above story. I am now running without a Tibialis Posterior Tendon/Muscle as it ruptured completely in 2010 and was too far gone for the surgeon to do anything beyound clean up the residual mess. I have since declined offers of cortisone injections by specialists for other injuries. I am surprised by how willing/keen specialists are too use cortisone as a cure. Great to hear from you Debra, after such a long break. Yep, cortisone is back with a vengeance. Like you I am disturbed at how quick these are resorted to. What we see later is frayed tendons that snap with the most modest of use. How is your foot now? It sounds terrible what has happened since.